From in 2019, the notorious R0 Brussels ring road will be completely redeveloped in a controversial move to separate local and through traffic. Also, big fine for Portugal truck breaking double-manning rest rules in France. The first vehicles on the European Truck Platooning Challenge leave Sweden. Soon illegal to smoke in cars with kids in Gibraltar. Local and through traffic separated to reduce accidents and delays. 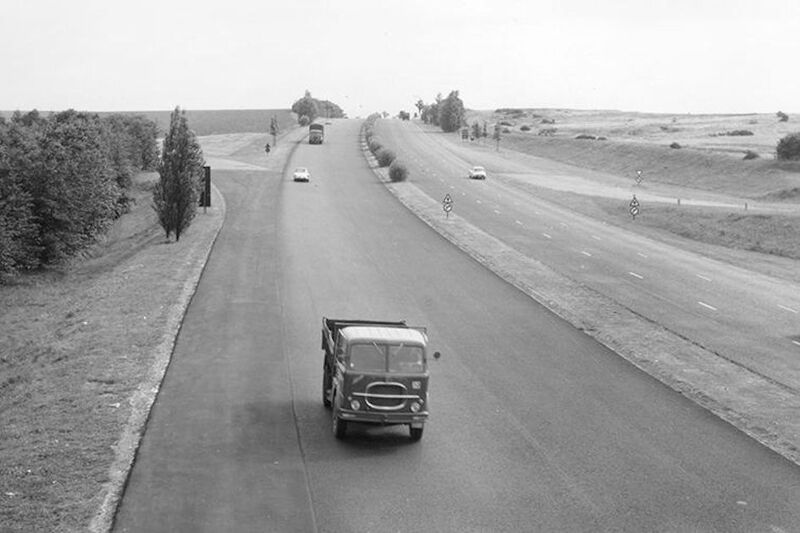 The first section of the R0 Brussels ring road opened in 1958 in the west with the rest opening in stages until 1977. Photo WerkenAanDeRing.be. See more photos. Separating local and through traffic will reduce accidents and delays on the Brussels ring road according to new redevelopment plans published this week. With 102,000 vehicle crossings each day, R0 is one of the busiest roads in Belgium (and Europe). It is also one of the most accident prone with 1100 separate incidents in 2014, an average of more than three per day. Currently there is a junction approximately every five hundred meters resulting in frequent lane changes. In the future this will be reduced to five ‘choice zones’ where drivers have 2km to switch between local and through lanes. According to the Flemish government, ‘Not only the hard infrastructure of the Ring but also the way traffic is organized is outdated. In some places there are five or six lanes next to each other without any separation. The result is a chaotic road layout of cars and trucks crisscrossing each other and thus there is an increased risk of accidents. However, the government points to a similar scheme on the A2 Eindhoven bypass in 2009 which apparently saw a sharp drop in accidents and congestion. Work on R0 starts in 2019 and is estimated to cost €1.2 billion. An end date will be announced after tenders are issued but the refurb should take less than ten years. Final plans should be published at the end of this year or in early 2017. In addition there will also be 40km of new cycle lanes, an ‘ecobridge’ for wild life (and people) at Laarbeekbos in the west and three new tram lines. The major interchanges, with the E40 west and east and the E19 and A12 to Antwerp will also be overhauled. Whether the speed limit will be lowered from its current 120kmh remains an open issue. New enforcement technology is integral to the plans and likely to take the form of average speed detectors. roundup: FRANCE. Interesting that a story about the abuse of double-manning driving time should emerge as France’s apparent new rules on the practice are under fire from the EU. A Portuguese-registered truck was detained last Saturday with the drivers found to have driven for 49 hours almost non-stop according to AutrouteInfo.fr. Total breaks in that time mounted to 45 minutes. The vehicle was picked up at the A83-A10 interchange in Deux-Sevres near Niort. It was allowed to proceed the next day after the drivers were rested and a €9000 deposit was paid. ‘This is extremely dangerous in terms of road safety and this is, moreover, unfair competition vis-à-vis other carriers,’ the local police chief told Le Parisien – incidentally picking up on the other major issue in French haulage at the moment – unfair competition – the subject of a nationwide protest on Saturday 9 April. Needless to say, unions were upset to hear the minister of Transport say this weekend he was opposed to any change in competition or cabotage rules – though he did say a report was due on 15 April which could point the way to increased controls on vehicles. GIBRALTAR. Smoking in enclosed vehicles with children present is an offence as of Thursday (31 March). A child is defined as someone under the age of 18 says the release from Government of Gibraltar – though it doesn’t mention the penalty. An enclosed vehicle is one covered ‘wholly or partly by a roof’. It is already an offence to smoke in enclosed public spaces and public service vehicles in Gibraltar. Similar rules exist in the UK, France and Italy.